After months of teasing, tweaking, and controversy, Firefox’s native ads have finally landed on the stable release’s New Tab page—and just like we said when we saw the ads in Firefox’s nightly preview builds, they’re actually not so bad. They’re unobtrusive, clearly labeled, and only collect user information in "aggregate form, meaning no data is personally identifiable." And the ads reduce Mozilla’s overwhelming reliance on Google—which definitely does collect personally identifiable data—for revenue, which is nothing but a good thing for the future of the browser. The Citizenfour tile is a sponsored tile in this screenshot of Firefox's New Tab page. Even so, not everyone wants to see them. And continuing in Mozilla’s pro-choice, pro-privacy tradition, Firefox makes it easy to disable the New Tab page ads. Just open a new tab, then click the gear cog in the upper right-hand corner of the page. Three options appear in a drop-down menu: Enhanced, Classic, and Blank. The new ads will only appear if you’re using the Enhanced option, which is enabled by default. 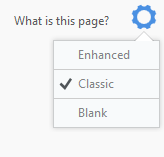 Selecting Classic will force the New Tab page to only display sites from your browsing history, while Blank is, well, a blank page. No aggregate data is collected once you disable the Enhanced tiles, either. And that’s it! Once you make that one, simple change, ads are gone forever from Firefox’s New Tab page. But consider what you’re doing before you flip the switch—Mozilla needs money to continue developing Firefox and fighting for the future of the open web, and the ads truly aren’t much of an eyesore.